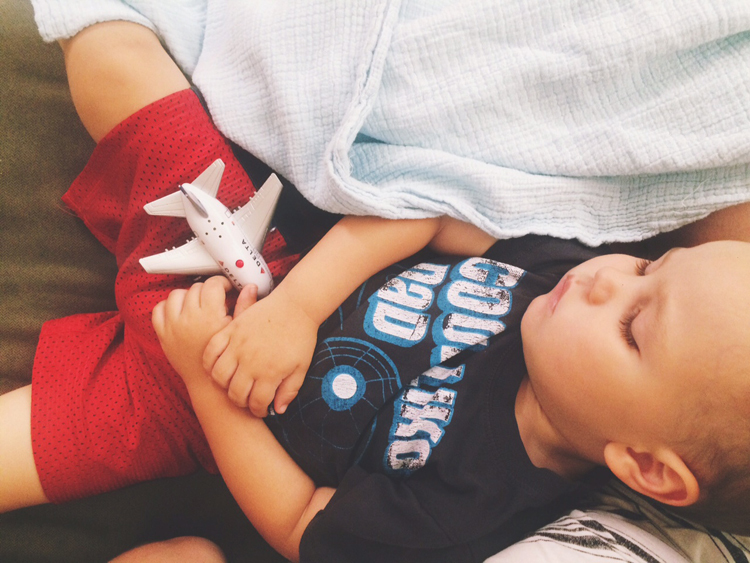 10 tips for flying with babies and toddlers. Within the last year I've made two airplane trips with my kids. The first one was when I was about 6 months pregnant, Peter was 27 months, and James was 15 months. My husband was not with us but I was traveling with family and that was extremely helpful. The second time I had my husband with me and I was no longer pregnant. Both experiences were exhausting and a little stressful but manageable. Flying can be a little crazy to begin with and adding toddlers and babies to the mix can be a bit intimidating. Several people were surprised to find that we were taking all three kids on a plane. I am happy to report that it is in fact possible. Challenging. But very possible. So here are my tips for flying with babies/toddlers. Some of these may seem painfully obvious but I don't want to miss anything. ~Comfy clothes. The boys were in tee shirts and shorts and Aria had a long sleeved onesie. I also made sure that I was wearing a top that was good for nursing. I wore my nursing tank from Target plus a flowy top. That way it was easy to nurse and I could do so discreetly. ~Sweaters. I had a light sweater packed for everyone in the carry on bags. Airplanes get cold so I wanted to make sure I could easily bundle the kids up if need be. ~Snacks. I packed a ridiculous amount of snacks because you never know when you could be delayed. Plus a lot of in flight crankiness and boredom was avoided by just handing the boys a snack pack of goldfish to munch on. I had granola bars, crackers, fruit snacks and lollipops. The lollipops really come in handy during takeoff and landing. The sucking helps their ears pop! ~Essential oils. If you’re a fan of EOs then I suggest using one of the calming blends or lavender once you’re on the plane. The kids have a “sleepy blend” and I put a little behind their ears before boarding. It helped them associate the time on the plane with well...sleepy time! We still had our share of meltdowns but no one was bouncing out of their seats which was good. ~Movies. Before we left, Andrew downloaded a few movies from itunes onto his ipad. This way we had some entertainment for the boys. When we traveled in October I brought the laptop for movies. That worked fine but an ipad is much lighter than a laptop. ~Activities. A few months before our trip I started looking in the dollar section at Target for books and activity pads. I came across some really good ones. They were inexpensive and super toddler friendly. These were good for when the movie was over (or they were just over it) and they would buy me about 20 minutes of peace or so. I highly recommend the Crayola Wonder markers because then they can’t mark up the airplane seats. ~Little toys. I don’t know about your kids but my kids love anything brand new. So packing a few cheap little toys that they’ve never seen before helps a lot. Make sure it’s something that if you lose or rolls under the seat, it won’t be a big deal. But that’s a hard call to make because toddlers get attached to the most random things…. On the way back from Florida my Dad bought Peter and James a little airplane at the gift shop in the airport (pictured above). They LOVE THESE PLANES. The planes have a little button on top that makes "take-off" sounds. It really helped them understand what was going on. Plus they stayed occupied with them for good chunks of time on and off. They are perfect little toys for toddlers on a plane. ~Baby wearing. When we traveled in October I had James in the Ergo and Peter in the umbrella stroller. Toddlers move at two speeds; lightening or snail. So in order to avoid losing them or missing our flight, I decided that babywearing plus a stroller were a must. When we flew a few weeks ago, I wore Aria in my Lilly And Mama ring sling, and put the boys in the double stroller. ~Wing pins. God bless the flight attendants. They meant well but giving the boys the little "pilot wings" was not the best idea. Sharp objects and toddlers just do not mix. If the flight attendant gives your toddler a pin, take it, and say thank you. Then immediately put them away. AND, make sure you put them in a place where you won't be sticking your hand in to fish around for something. I stabbed myself one time like that thanks to those wings. Not fun at all. ~Smile and wave. There is no way to avoid the ugly looks from people. I swear, some people look at kids like they have never seen a child or baby before in their life. People will throw shade when your baby is crying or say rude remarks but just smile and try to be nice. When someone would look back rudely to see who DARE bring a child on a plane I would obnoxiously smile and wave and that would pretty much be the end of that. I know it's hard to ignore rudeness but don't waste energy on those people. Just focus that energy on your kids. Ok so that’s what I’ve got. Flying with toddlers and babies is by no means easy but hopefully these are tips that can help make the trip a little less stressful. If you have any other tips please let me know and I’ll add them!